I spent most of my week trying to help colleagues retool budgets, which is never a pleasant task. Everyone is being asked to do more with less. In healthcare, sometimes that’s extremely tricky. I’m lucky in that my medical informatics group is a department of one. I don’t have to worry about our current hiring freeze or the potential of laying anyone off unless they decide they don’t need a CMIO any more. With the current climate in MU, that’s unlikely. We already had our travel and conference budgets slashed last year, so there are no surprises there. We’ve already figured out how to receive education and training for free — no surprises there either. The hospital where I work is fully committed to its brand spanking new Accountable Care Organization. It has announced that it’s putting all hands on deck to make sure we’re investing in care management, patient engagement, and marketing. We’re going to spend tens of thousands of dollars making sure patients don’t want to leave our organization so that we can achieve shared savings. We’re going to make sure that we’re their hospital of choice. As a part of that effort, I’ve been asked to prepare a handwritten thank you note and deliver it personally to each patient I discharge from the emergency department. I’m also supposed to recite a fairly canned statement about how much I appreciate the patient choosing my hospital and thank them for the opportunity to deliver excellent customer service. After 5 p.m., we only have one housekeeper on duty for the entire ED and two floors of the hospital. Nursing staff and patient care techs are expected to clean all the emergency department rooms after patient discharge. Most of the time we don’t have a tech, so an RN (or sometimes the physician) is cleaning rooms. I know this is not a new phenomenon, but it’s still not right. This also means that if we have a situation where we need a “terminal clean” of an exam room (highly contagious disease, etc.) we have to shut down the room, often for hours, while we wait for housekeeping. Lack of housekeeping also means trash is overflowing in the exam rooms. But there’s more. To cut down on costs, staff has been asked to conserve on the use of trash can liners. I didn’t believe it until someone showed me the memo. This means that rather than pull up the plastic bag around the trash, seal it, and carry it to a larger waste receptacle, they are expected to wheel a larger receptacle into the exam room, heft the trash can into the air, and dump the trash into the larger can. Inevitably things wind up on the floor, not to mention the potential for infectious material to be flung into the air. This is also done with biohazard cans, although I haven’t seen a specific memo that says that the can liner recommendation applies to “red bags.” Leaving the liner in leaves the bacteria in. Whoever came up with that policy should be gifted with a trash can containing a used diaper. We no longer follow isolation protocols in the “low acuity” portion of the ED because our patients are “low risk.” Last time I checked vancomycin-resistant enterococcus didn’t play favorites. Exam rooms are often “turned” so quickly that registration brings new patients back before the room has been adequately cleaned. Non-clinical areas do not get cleaned at all. The floor of our work area in the ED is so dirty that staff places towels or drapes on the floor before depositing their tote bags (no, we don’t have lockers). IT hardware is no longer cleaned. That picture above is the keyboard I was greeted with last week. It is not fit for use by anyone. The worst part is that there was visible food on it, meaning someone touched it while also touching food. It is in this circumstance that I am expected to write thank you notes. This is in between trying to see patients, providing decent quality care, getting all my documentation competed (including the mandatory sepsis screen we just added for all ED patients regardless of presenting problem), educating patients on not coming to the ED inappropriately, serving as my own social work staff, figuring out how to get patients to afford their $4 generic prescriptions, and convincing patients that plugging their iPhones in to the outlet above the bulging biohazard trash can so that the cord dangles into it is a bad idea. You’re probably thinking right about now that I work in some third-world hospital. Not so much. We’re urban and safety net, but we’re decidedly first-world with an academic presence. We have the endowment to prove it. You may also think I’m just complaining, but seriously, I love my job. I love the people I work with. I love my patients, even the ones who are handcuffed to the gurneys for the duration of their stays. I apologize for the wait. I apologize for delays. I apologize that the police used a Taser on you and I ask you politely to stop spitting at us. I apologize to the other patients for having to witness your behavior. I thank patients for coming and wish them well even when they scream at me or when I have to call armed guards to help discharge them. But if the administrators want thank you notes, they’re going to have to hire Emily Post. Maybe she’ll bring a feather duster (or a blowtorch) to clean the computers. Good luck with making our facility the destination of choice. Congrats to the marketing team that dreamed up the thank you note scheme. Maybe we should start with basic sanitation if we want patients to come back. It’s hard to understand how we’re going to be meaningful users of EHR technology when we can’t be meaningful users of sponges and mops. Have a story of administrative ridiculousness? Can your gross pictures top mine? E-mail me. and to think, Dr J, we only spend 60% more on healthcare than any other nation. Of course, we are the only nation without national healthcare. Heavens to Betsy, I think this is one of my favorite Dr. Jayne posts. I am absolutely stunned by everything in that article. 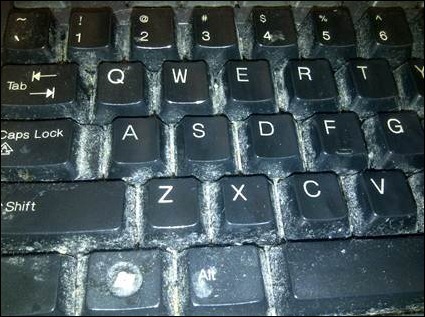 I cannot even imagine touching a keyboard that looks like that. I think the thank you notes are absurd. Are you supposed to write thank you notes for all the patients? Even the acuity 5s, that would be acuity 10 if the scale went that low and could’ve easily been seen in the clinic in whatever appointment was next available? My family and I were visiting the Raleigh Durham area over the Martin Luther King holiday weekend when I had excruciating pain in my abdomen. I asked my wife to take me to the ED at a prestigious AMC in the area (Duke). First, I Was greeted by guards, and had to go through a metal detector; then I was made to wait in the filthiest waiting room I’ve seen in the US (I’ve seen worse in the third world – kudos to Duke). And then finally, after only 2 hrs waiting and still in severe pain, I was taken to an exam room which grossed me out so completely that all I wanted to do was leave! There was an inch of sputum clearly still visible in the suction aparatus on the wall, and there was dried blood on the gurney matress pad and hardware. Now I wish I had taken pictures to send you!! Unfortunately, it took them another two hours to diagnose me with a kidney stone. The doctors were great, but once I had my diagnosis I told them that I was going to walk out in 15 minutes even if we were not done. The Resident discharged me ten minutes later. My son was in a local, urben ED two weeks ago on a Monday morning after a minor car-bicycle collision and received excellent care, but the floor of his room had several spots of dried blood or disinfectent. I guess the lack of night-time ED housekeepers is a national trend. There was no thank you note proffered, so the identity of your employer is still unknown to me! Thanks for another great but exasperating column. Some of the best Hospitals, Healthcare and outcomes are found in the third-world- places in India, Brazil, China, Phillipines etc they have the best board-certified talent, latest and greatest technology, hardware, software you name it! Insults aimed at the Third-World seem unnecessary for the purpose of this commentary by folks who seem to have never stepped out of their never neverlands.